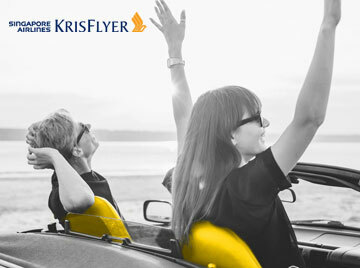 From 1 April to 31 May 2019, KrisFlyer members who book a car for 5 days and pickup by 30 June 2019 at participating Hertz locations in USA, Canada, Europe*, Australia, New Zealand or Asia^ can enjoy 2,000 KrisFlyer miles and 10% off. What's more, you can get additional 200 KrisFlyer miles for every extra day you rent. To enjoy the offer, enter the below CDP# and PC# 204148 (USA, Canada, Europe*, Australia or New Zealand) or PC# 168092 (Asia) during reservation, and your KrisFlyer membership number at the “Review & Book” step. If you are not a Hertz Gold Plus Rewards member yet, enrol for free to enjoy faster and easier car rental services. Offer is valid for self-drive rental bookings made on Affordable Rates (leisure retail rates) from 1 April to 31 May 2019 and for vehicle pickups at participating locations by 30 June 2019, and completion of rentals by 15 July 2019. Offer is valid for rentals with applicable CDP number, PC number and a valid PPS Club/ KrisFlyer membership number of the renter. Offer is valid on Compact and larger cars, excluding Hertz Collections. Offer is subject to a minimum rental of 5 consecutive days. Additional 200 KrisFlyer miles for every extra rental day is valid on rental of 6 consecutive days and more. Only one offer can be used for each rental. Please present your PPS Club or KrisFlyer membership card at the rental counter. Minimum rental age applies and all drivers must be in the possession of a valid driver's license, which must be held for at least 1 year (2 years in Hong Kong). Offer is not valid on tour/pre-paid, travel industry or any other special rates. 2,000 KrisFlyer miles will be automatically credited to members' account within 6-8 weeks upon completion of qualifying rental. Any extra bonus KrisFlyer miles will be automatically credited to members' account by 31 August 2019. Hertz standard rental qualifications, rental period and return restrictions in effect at time and place of rental, as per applicable rate plan terms & conditions.